I believe our pets will be in heaven with us. I take comfort in this belief, and was forced to draw on it this morning when we found our iguana had passed away. Bill found Hulk at a pet store near the Marine base he was stationed, not long after we met. Normally we don’t buy pets from pet stores, but he had been severely neglected and we felt we had to get him out of there. We brought him home and got him his color back and worked with him to make him more comfortable being held. The cop told me to slow down and try again. I picked up the towel in the passenger seat and displayed the tail as close to the cop as I could. I never saw anyone turn so green. He stepped back, put his hands up, and told me he believed me, and I could put “that” away. When he finally understood why I was in a rush, he just told me I needed to slow down, and be careful. My iguana got me out of a speeding ticket! I followed the speed limit the rest of the way to the vet. Once I had Hulk inside, they took a quick look and assured me he would be okay. I knew tails grew back, but this was Bill’s baby! They gave him some antibiotics, cauterized his tail, and he was home within hours. The tail did mostly grow back, but I still feel bad for leaving the door to the sun-porch open. Poor lizard. In other animal news this week, Diesel, our chocolate lab, turned 16!!!!!!! Also, Isis, our cat, not a terrorist (though she has some moments of terror!) escaped out the door and was gone for a day and a half. It broke my heart and I went as far as printing up flyers which Bill brought around. Ray, our other cat, cried the entire day and a half. At 0530 yesterday morning, Bill jumped out of bed and yelled “Kitten Face” as he ran to the window. Isis has a face of a kitten she never outgrew. It’s just one of those stupid nicknames I can’t explain. Sadly, I’m not sure how to make Bill feel better about Hulk. 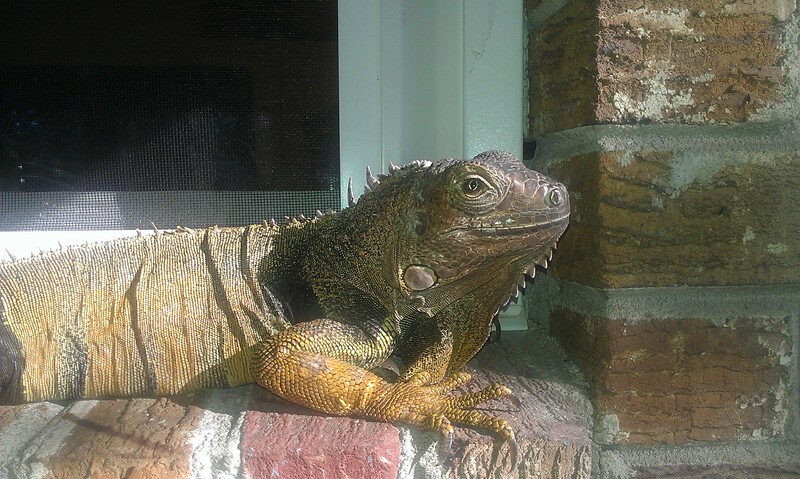 We won’t be getting another iguana until after the move, but I’ll have to find something today to cheer him up a bit! For now, we have enough pets in this zoo and the baby is going to be here in less than a month!!! !